This article is about the microgame from WarioWare: Twisted!. For other uses of the term "Outta My Way", see Outta My Way. Info Don't trip up on your road trip! Outta My Way! is one of Mona's microgames in WarioWare: Twisted! The player controls a red car. This game's objective is to move the car left and right to avoid the obstacles found in the player's way. These obstacles change whenever the game's difficulty does. If car dodges all of them, the player wins. However, if the can runs into one of them, the player loses. 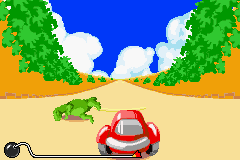 Level 1: The car must avoid plastic dinosaurs. Level 2: The car must avoid blue cars coming in the opposite direction. They can move left and right. Level 3: Same as Level 1, but sometimes they fall. This page was last edited on September 26, 2018, at 10:06.